Here are just a few reasons you might have to visit a court room or an office of the court in Arizona. When you think of a court room, you might think of scenes out of legal dramas, with lawyers facing off in a battle of wits against high stakes. While Arizona criminal cases certainly are tried in a court room, many more legal proceedings take place in court than you may think. You can head down to a designated passport office such as a post office to fill out the application for your passport, or you can head down to the local court house. Going to the court might be more convenient if you have to get copies of your official documentation, such as your birth certificate or your child’s birth certificate. If there are any special circumstances related to your passport application, going to the court house might be your best option since you can get legal advice about how to handle your extenuating circumstances. When you plan a wedding, you might be focused on finding the perfect dress or booking the best caterer in town. Yet the most important thing you’ll need is a marriage license. Without it, your wedding is just a symbolic ceremony, but you won’t be legally married. You’ll have to show up in person at the court house to apply for your marriage license. If you’re so inclined, you can go ahead and get married while you’re there. You can then have the freedom to have whatever kind of ceremony you want with your family and friends, regardless of whether you have a legal officiant overseeing the ceremony. Your local court house is the keeper of a great number of official records. For example, you may need to go to the court house to get a copy of your birth certificate, a name change order, a copy of the deed for your house, a death certificate, or information about your automobile taxes. Sometimes, you can request copies of these documents in the mail, but putting in the request in person will help you save time and money. The most acrimonious of divorces are battled out in front of a judge in the courtroom, with Arizona divorce lawyers on both sides defending the interests of each spouse. However, you can save yourself a lot of time and money by working out an agreement with your spouse yourself and filing the paperwork yourself. Just fill out the proper paperwork, file it with the court and pay the fees and you’ll have the divorce you want. This simple divorce is best for couples who don’t have many shared assets and who don’t have children. Sometimes, going to the court house is necessary for simple things like requesting copies of official documents. However, when you need to take care of more complex business, like filing for divorce or disputing a tax matter, it may be best for you to consult with an experienced attorney. The team at My AZ Lawyers may be able to help. Our attorneys have experience in many fields of law, and they can help you with everything from filing for bankruptcy to defending criminal charges. 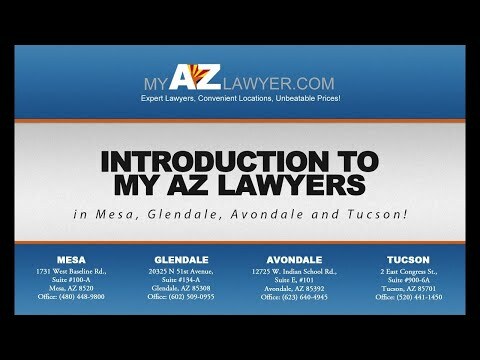 Call My AZ Lawyers today to learn more about our services and to schedule a consultation with an attorney. The Problem with Unmarried Parents Splitting Up!